We enjoy paella year-round but it's also one of our favorite dishes to serve during the holidays, especially on Christmas eve. This authentic paella recipe is a veritable cornucopia of seafood - shrimp, scallops, and clams - all of which can be found throughout the year. It's a delicious and beautiful dish to serve guests, simply place the paella pan in the middle of the table and serve from there. Peel the shrimp and reserve the shells and heads. Place in a pot and add about 4 cups of water and a pinch of salt. Bring to a boil then simmer for 15 minutes. Meanwhile, heat half the oil in a large skillet. Add the onion and cook over low heat, stirring occasionally, for 5 minutes, until softened and translucent but not browned. Add the tomatoes and cook, stirring and breaking up with the side of a wooden spoon, for 5 minutes more. All to cool slightly, then transfer to a food processor or blender and process to a purée. Scrape the purée into a paella pan or large, heavy skillet. Scrub clams under cold running water, discarding any with broken shells or any that do not shut when the shells are tapped. Put clams into a pan, pour in 1/4-cup water, and bring to a boil. Cover and cook over high for 3-6 minutes, until the shells have opened. Remove the pan from the heat and lift out the shellfish with a slotted spoon, reserving the cooking liquid. Remove and discard any clams that have not opened and any empty shells. Set aside. Strain the reserved cooking liquid through a cheesecloth-lined strainer into a bowl. Strain the shrimp stock into the same bowl. Add enough water to make a total of 7 1/2 cups. Pour the stock into a pan and heat, but do not allow to boil. Pour the remaining oil into the paella pan. Add the green bell pepper and cook over medium heat, stirring occasionally, for 3-4 minutes. Add the rice and cook, stirring constantly, for a few minutes, but do not let brown. Season with a pinch of salt and pour in the hot stock. Gently shake the pan to make sure that the liquid is evenly distributed. Pound the garlic and saffron in a mortar with a little salt, or process in a mini food processor. Mix in the warm water, and add to the paella pan. Gently shake the pan or stir with a wooden spoon so the mixture is evenly incorporated. When about three quarters of the stock has been absorbed, arrange the scallops, shrimp, and clams attractively in the pan. Continue to cook until the rice is tender and all the stock has been absorbed. 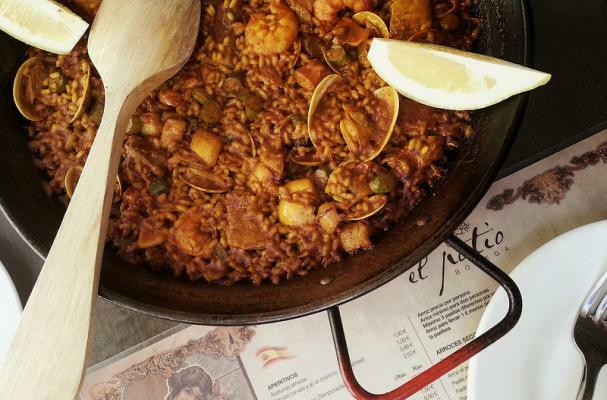 (Note: The paella usually takes a total of 20 minutes to cook from the time the stock is added, but this depends on the type of rice used. To avoid overcooking the shellfish, do not add until the rice is close to being done and about a quarter of the stock remains). Serve the paella in the pan and garnish with lemon wedges.